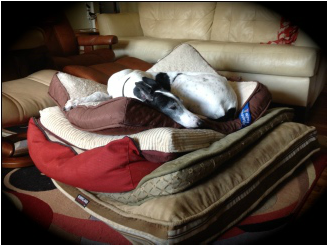 GAGC is an organization dedicated to finding good homes for retired racing greyhounds. We are also dedicated to encouraging community awareness of the availability of racing greyhounds for adoption, and the suitability of retired greyhounds as loving family pets and companions. We stand with the amazing breeders, owners, and trainers who provide us these dogs we love. See our available GREYT Dogs! PLEASE DONATE- GAGC depends on your generosity to continue to foster and place happy, healthy retired greyhounds. Please click the button at the right to make a safe, secure donation! To strive for the best quality placements. We focus on ﻿being﻿ small and doing things right. We recognize that we cannot offer homes to an unlimited number of greyhounds, but we can make a difference to the ones we touch. That is why our focus will be on quality of placement, not quantity of placements. We formed our group in 2002 to provide local service and support to our present and future Cincinnati/Dayton area adopters. G.A.G.C. is incorporated as a not-for-profit charitable organization. We operate with a Board of Directors, and we have three experienced placement representatives in the area. We service an area of 50 miles around Cincinnati, as well as 50 miles around the Dayton area. As a non-profit we have limited resources, so we will need your help to continue. In March of 2003, we received tax-exempt recognition under section 501(a) of the Internal Revenue Code as an organization described in section 501(c)(3). This recognition allows G.A.G.C. to receive donor tax-deductible donations to further the future growth and development of our organization. If you can help, we are in need of donations, and they're tax-deductible! There are greyhounds waiting for homes that are counting on our success!